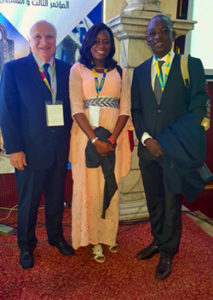 Young neurologist Prisca-Rolande Bassolé, (center), meets WFN President Raad Shakir (left) and Amadou Gallo Diop, the Africa Initiative Task and Advisory Force for Africa Trustee, at the first AFAN Conference in Tunisia. The inaugural meeting of the African Academy of Neurology (AFAN) took place in August 2015 in Dakar, Senegal. In a brief presentation, two young African neurologists identified and summarized the expectations of their generation about this African academy1. Two years later, the first AFAN conference took place March 15-18 in Yasmine- Hammamet, Tunisia. It was co-organized by the Tunisian Society of Neurology and the Pan Arab Union of Neurological Societies, which met at the same time with the help of the International Auspices. 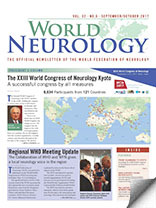 Members of the International Auspices are the World Federation of Neurology, the European Academy of Neurology, the American Academy of Neurology, the Movement Disorders Society, the International League Against Epilepsy, and the Middle East North African Committee for Treatment and Research in Multiple Sclerosis2. The conference represented a great opportunity to enhance regional and international cooperation with these other societies and organizations and to improve the education of young African neurologists. 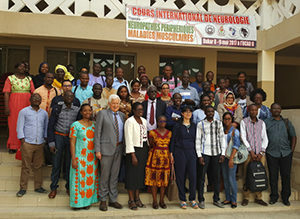 Residents and young neurologists with the teachers at the International Course of Neurology on the Peripheral Nerve and Muscular Diseases, presented May 8-9 at Cheikh Anta Diop University. AFAN is committed to participating in the training and continuing medical education of young neurologists. Two months after this first conference, AFAN organized the International Course of Neurology on Peripheral Nerve and Muscular Diseases with the Pan African Association of Neurological Sciences and the French Society of Neurology. The course took place May 8-9 at Cheikh Anta Diop University in Dakar, Senegal. Seventy residents and young neurologists from 18 countries attended the course. The attendees represented Benin, Burkina Faso, Burundi, Cameroon, Congo, Congo Brazzaville, the Democratic Republic of Congo, Djibouti, Gabon, Guinea Conakry, Ivory Coast, Mali, Maroc, Niger, Rwanda, Senegal, Tchad, and Tunisia. Attendees benefited from the interactive topics that were presented over two days by teachers from France, Ivory Coast, and Senegal. Prisca-Rolande Bassolé is an African neurologist from Burkina Faso. Amadou Gallo Diop is an Africa Initiative Task and Advisory Force for Africa Trustee. Mouhamadou Mansour Ndiaye is the first president of AFAN and a member of the Neurology Department/FANN Teaching Hospital in Dakar, Senegal. The authors declare no conflicts of interest.